A modern version of the beanbag chair, Jaxx Sacs represent a more savvy, stylish and comfortable seating alternative. Create a relaxed, informal setting, or liven up your home theatre, gaming room, or playroom! 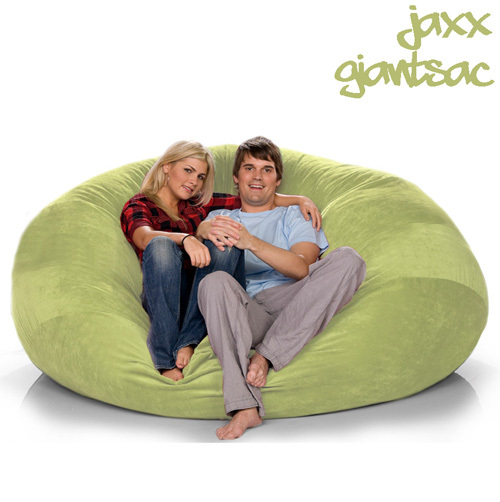 Jaxx GiantSac is the largest beanbag we've ever sold and it's a world apart from the ordinary. Providing colossal amounts of comfort, as well as appealing to modern design, you'd swear it came right out of a fairytale. With enough space for several friends, this JaxxSac can be used as a couch in a family room, a guest bed, a media room crash pad, or anything else the imagination can conjure. Dimensions: 7'W x 3'H. Color: Apple.